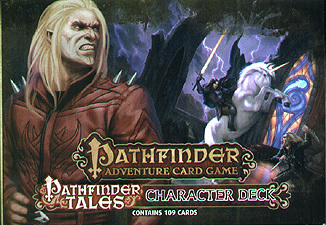 The Pathfinder Adventure Card Game: Pathfinder Tales Character Deck features three new storied characters. Play aristocrat Varian Jeggare or his rough-and-tumble bodyguard Radovan, or the sharp-tongued naga pirate Celeste! This 109-card accessory for the Pathfinder Adventure Card Game gives you the cards you need to make your game a masterwork. Perfect for any Pathfinder Adventure Card Game Base Set or in the Pathfinder Society Adventure Card Guild organised play campaign!